Steve-O had the most liked content! Yeah the outdoor power equipment association took the wrong road on this. They have had an inflammatory anti ethanol ad on radio for two years now. Looks great works fast but can't find a way to submit a price after logging in.... Maybe it's in progress. Wow I had been away for awhile, but i just posted 3 prices and they appeared immediately. Has something changed in the last 3 months? Hi Y'all.... Just posted the current pricing at this station. Thanks! Kwix Trip offers free vehicle propulsion/service! They have another mega store opening here, in Menasha before Halloween too I will report that one once opened. Also Kwik Trip is expanding like crazy in two ways. Assimilation (no E-85) and new constructions (seem to all have E-85). Alot of good points fleebut. Everyone that is an advocate to the point of using ethanol fuels realizes, as do you, that corn ethanol is just as good as any. And the ag industry here developed a great way of making alcohol from it. Brazil is doing it with a product that they can grow that is not the same. And alot of other potential sources exist too. But we also know that all of the blantantly false but emotional arguments are either winning 1) Because nobody cares as long as they can afford gas, or 2) Nobody cares to look behind a purchased headline, or 3) People often live their liveds by I heard that, or I read that, or My mechanic said that... blah blah blah makes me angry. I try and try and have had very few people put any credence in what I say and think I am nuts! Anyway, I agree, and in the last couple years some groups have put out factual studies, videos, and things to show truth and improve the image. Wherever we get a chance to share these on social media etc we can help. But I also agree that this image problem is the only reason that perople aren't more interested in running on alcohol. I think the industry does what they can... being so out-gunned in the information war. Maybe different bio material will help as we figure out how to efficiently turn it into alcohol, but the current industries, and us followers, will just keep chipping away at the BS. I think I am going to submit good feedback to Shell directly from this page/site you link to. Thanking them for introducing this fuel. First time I have done that on a major oil co. website. Do we have a little price gouging? 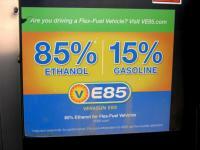 According to a poster on the prices site E-85 is going for $195.00 a gallon in Menomenee, WI. Thats OK because E-10 is $235.00 so the spread is still OK. Outstanding! Like the improved clarification of "conversion." Thank you! One more (sorry). Is there a bill currently that deals with official flex fuel capability in new vehicles? Thanks again!